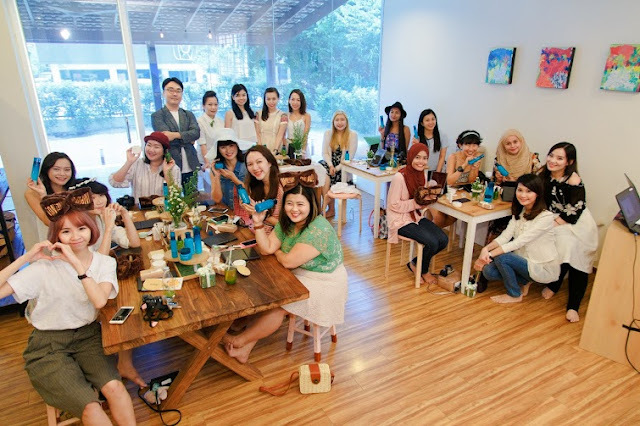 I had an amazing time at Innisfree Beauty Picnic a while ago in Organica Lifestyle in Bangsar! Wanted to write about it earlier but was really busy so here I am finally posting this up! A few days before the event, I was told to wear my picnic outfit. Honestly I never been to a real picnic in Malaysia because weather is so damn hot and feel a bit insecure with our security. 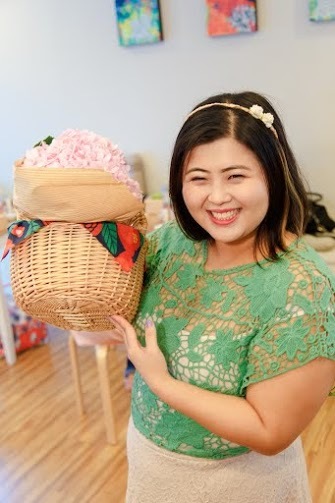 So I put on my self-imagine picnic #ootd to go to the event, wearing something casual and a hat thinking we will be having picnic under the sun! Ahh... thank god I arrived at the venue and it's fully air-conditioned! Can you agree with me that this place was decorated perfectly to fit to the event theme? Lots of flowers, green grass, picnic basket.... ah for a moment I thought I was in Jeju having a picnic! Love the details in the decorations that they put up.. Good job guys! Before we start with our beauty picnic with Innisfree, Johnny Nam, Brand Manager of Innisfree shared his short welcome note with us. He shared that Innisfree is often aspires to inspire consumers in ways to celebrate natural beauty while keeping it green. 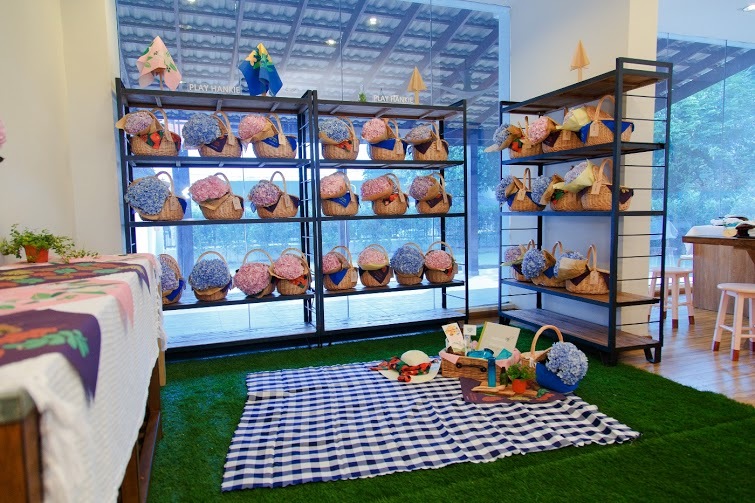 A beauty picnic is a form of inspiration of beauty lovers to meet and dedicate their time to appreciate the wonders of earth's produce. Ms Purple Tap is Innisfree Assistant Training Manager shared that Innisfree products are made from Jeju Island, Korea natural resources. 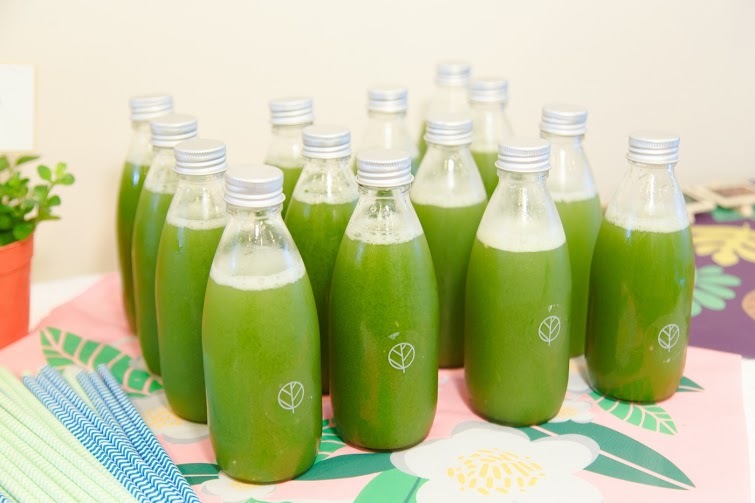 Ms Purple shared that in the olden days, Jeju pure sparkling mineral water is known as Gumyeongsu (life saving water), as it cured illness and saves lives. Its goodness has been told from generation to generation. Jeju sparkling mineral water is unique that it feels cold at the first touch as its temperature is lower than the body temperature. With the high carbonic content, it stimulates blood circulation and giving the skin a warm feeling. 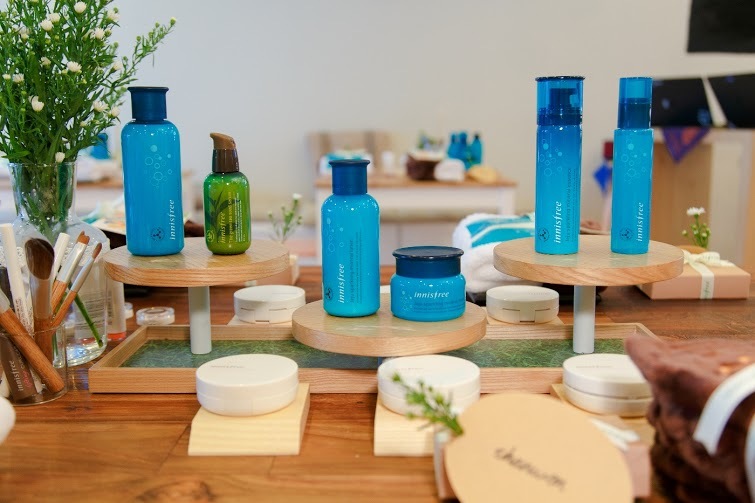 This new Innisfree new range is a daily hydration skincare range that uses sparkling mineral water as its main element. 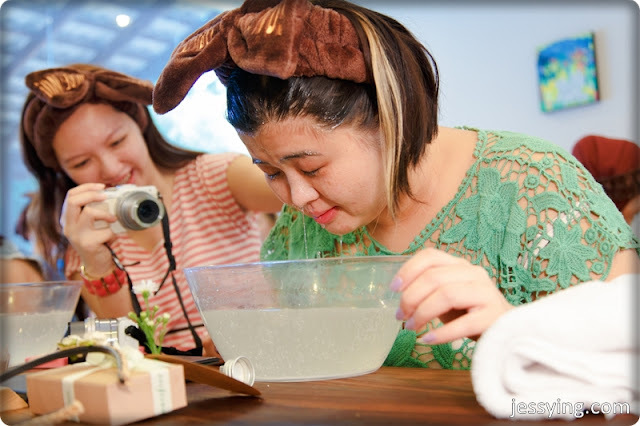 It promises your skin clear and moist from within while giving you an everyday hot spring spa-like sensation. 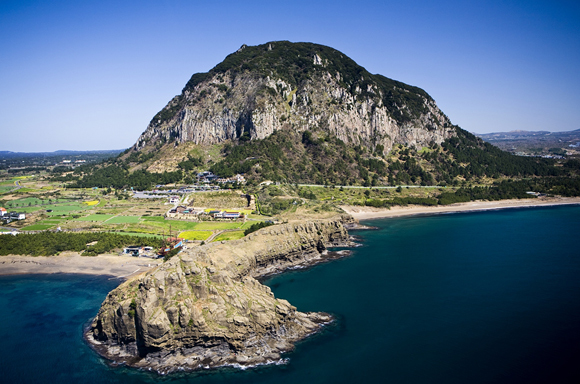 Jeju Sparkling Mineral is made from Sanbangsan Mountain's hot spring water in Jeju Island. We were told that this is not just normal water as this pure sparkling mineral water was formed 800,000 years ago and is drawn from the aquifer 535 meters deep underground. A very interesting fact that we were told is that this hot spring has an average temperature if 31 celcius and it's lower than general hot spring and this actually helps the carbon content of the water high. Carbonic acid from the hot spring has the ability to penetrate effortlessly into the skin due to its highly soluble state which increases the oxygen absorption ability of blood, muscles and skin. 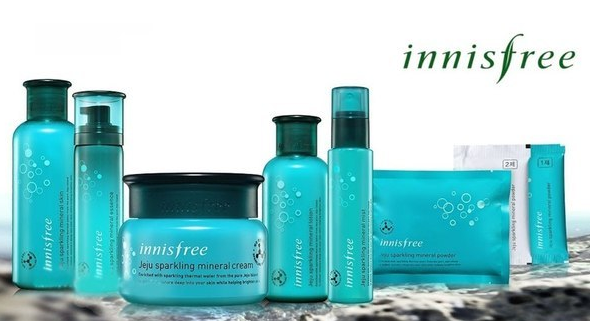 Innisfree Jeju Sparkling Mineral contains 3 types of carbonic acid and 13 types of hot spring minerals which convey active ingredients to the skin. I have been to hot spring no wonder my skin was always soft and moist after soaking, probably due to the carbonic acid. Interesting to see Innisfree is using hot spring water mineral to make into a skincare range cos I never seen any brands has use this ingredients. Innisfree Jeju Sparkling Mineral has a total of 6 products that ranges from cleansing powder, toner, essence, lotion, moisturiser (cream and lotion type) and mist. 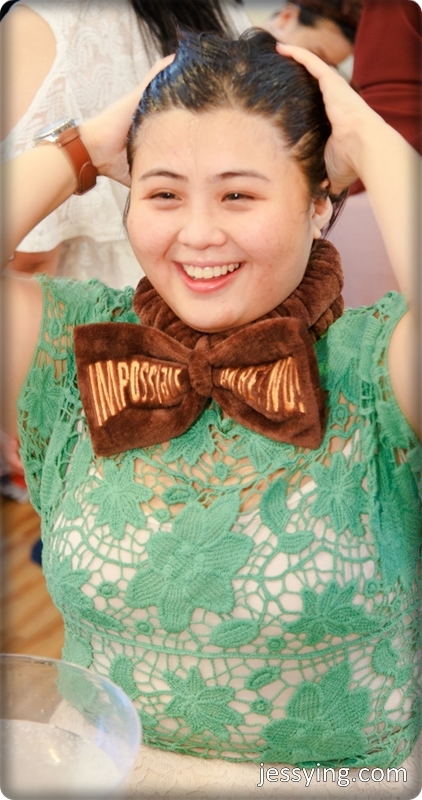 I wore my cute Innisfree headband and I'm ready to try out the products and share a little bit more on each range. So are you ready? Let's go! This is a cleansing powder with Jeju sparkling mineral water. Revitalize skin with this easy-to-use carbonic acid powder pack that clears and moisturises skin, giving skin relaxing spa-like treatment with carbonic acid hot spring water at the comfort of home. The fizzy bubbles form as the sparkling mineral powder dissolves into water, providing a sparkling massage effect. It also contains Jeju tangerine peel extract that cleanses away any dirt left inside our pores, giving instant brightening effect after washing the face. How to use : Get a big bowl that can fit your face. Fill in the bowl with water with about 1.5 to 2 liter of water. Add in Sachet 1 (blue pack) ad wait until it dissolves. Add sachet 2 (white pack) and stir in the water to make fizzy bubbles. Soak your face into the water for 2-3 minutes or wash your face using both hands to feel the effect of sparkling massage. Rinse off your face with lukewarm water. Watch a short video I posted in my Instagram @jessyings on how I do this. It's so addictive... haha... and I just bought a new pack again to enjoy the sparkling massage effect. First time trying cleansing powder in this way, would say totally unique experience. I felt my skin is refreshing and softer after soaking into this. And really fun to do! Note : If your skin turn red or flushing after soaking don't be alarmed because your skin is having blood circulation. It will calm down after a while. One of their best seller of all time, I have been wanting to try this! This water-like texture, the serum is made of 100% fresh green tea instead of water, and able to boast a five-times-better moisturising power after use and increases the moisture content inside the skin up to 66% while decreasing the amount of dead skin cells by 76% - keeping your face effortlessly crystal; clean. The light green tea scent is really pleasant. You have realised that I have put on serum first on my 2nd step of skincare instead of lotion. This is recommended by Innisfree because Green Tea Seed Serum will act as a booster. It will help to allow deep penetration and absorption of other skincare products into your skin. A deep hydration skin toner loaded with 88% sparkling mineral water that provides a powerful boosting effect. The ethanol-free toner (yay it's alcohol free!) is penetrated fast into the skin to smoothen the skin texture and to enhance the absorption of skincare products in the following steps. The acid balanced formula helps maintain a healthy skin by restoring the imbalanced pH after face wash.
You can either use cotton to apply this or just use your hand to apply this. I prefer the latter method and to pat all goodness from the Mineral Skin onto my skin directly. As there is no alcohol in the product, it's really gentle to the skin. The texture is extremely light and it's water. And the faint tangerine scent is really refreshing. My skin feel soft but not sticky! This contains 73.6% of sparkling mineral water. With the help of Micro Sparkling Technology, micro-sized carbonic acid bubbles that are smaller than pores are formulated to best fit onto the skin while facilitating penetration of active ingredients, making skin clean, clear and moist. Just like spa therapy, this delivers 5-in-1 intensive moisturising effect that helps with 5 skin concerns such as skin texture, balance uneven skin tone, keep skin firmness, strengthened the skin barrier and promotes blood circulation through massage. This is the first time I see serum in foam texture but it still absorb nicely onto the skin when I apply it on my skin. Love how my skin feel soft and supple! This Sparkling Mineral Cream is infused with 69.9% sparkling mineral water. The lightweight translucent fluid texture absorbs fast into the skin to form double moisture layer that remains all day long. The skin-friendly ceramide is stabilized in a fluid form, building a protective film to strengthen the moisture barrier on skin. To those who has oily or combination skin, you can use Mineral Lotion instead which is lighter than the cream. Personally I felt the cream texture is really light and easy to absorb. To those who are looking for instant and intense hydration, you can try Sparkling Mineral Mist which has 90% sparkling mineral water. It resolves dryness while supplying minerals to keep skin moisturized anytime and anywhere. Love how the mist texture is really fine and absorb onto the skin nicely providing a quick moisturising boost. Although this mist has oil extracted from coconut as one of the ingredients to help to retain moisture on skin, it does not leave the skin oily after spraying the mist. Tips of spraying mist, make sure you spray at 20cm away from the skin while keeping your eyes and mouth close..haha see I forgot to close mine and tasted some of the mist..
Innisfree Long Wear Cushion SPF50+/PA+++ helps to reduce the appearance of pores, discolorations, and imperfections and ensures a perfectly flawless complexion every time. The Long-wear Complex containing Jeju volcanic powder delivers flawless coverage with this long-wearing effect. Whether oily, dry or combination, "Sebum control" Jeju volcanic powder will intuitively adjust to meet and address your skin concerns for makeup that wears better, longer, and true. 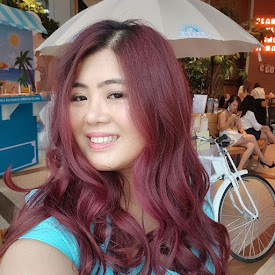 I love how Innisfree Long Wear Cushion instantly enhanced my skin complexion with the effect of reducing the appearance of pores, discolorations, and imperfections. Tadaa my after look from trying out their range! After the hands-on we have some very interesting DIY session with Shantini Iyngkaran, Founder of this beautiful venue Organica Lifestyle. Here is my own DIY jar salad! Super easy to make and delicious to eat! I also made DIY Sparkling Juice wih raspberry extract! Super love this healthy and fun beauty picnic! 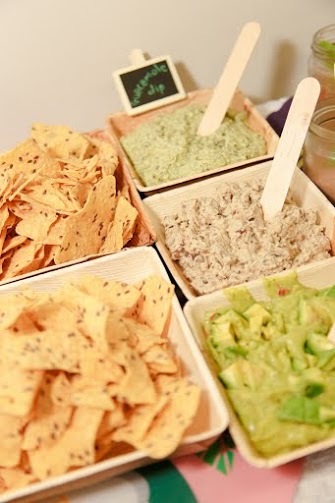 we had delicious organic food by Organica! This is the real beauty picnic! 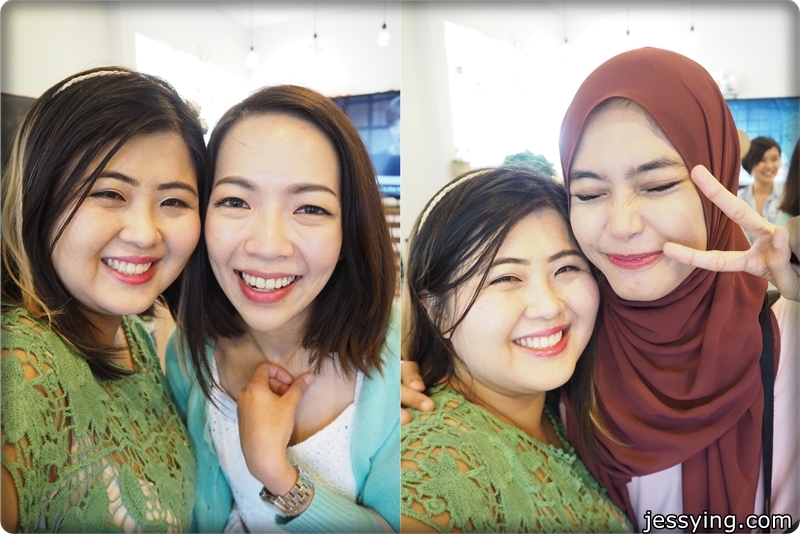 Looks how happy we are in the picture because we really had an amazing time at the Innisfree beauty picnic learning about their latest range Jeju Sparkling Mineral Essence! 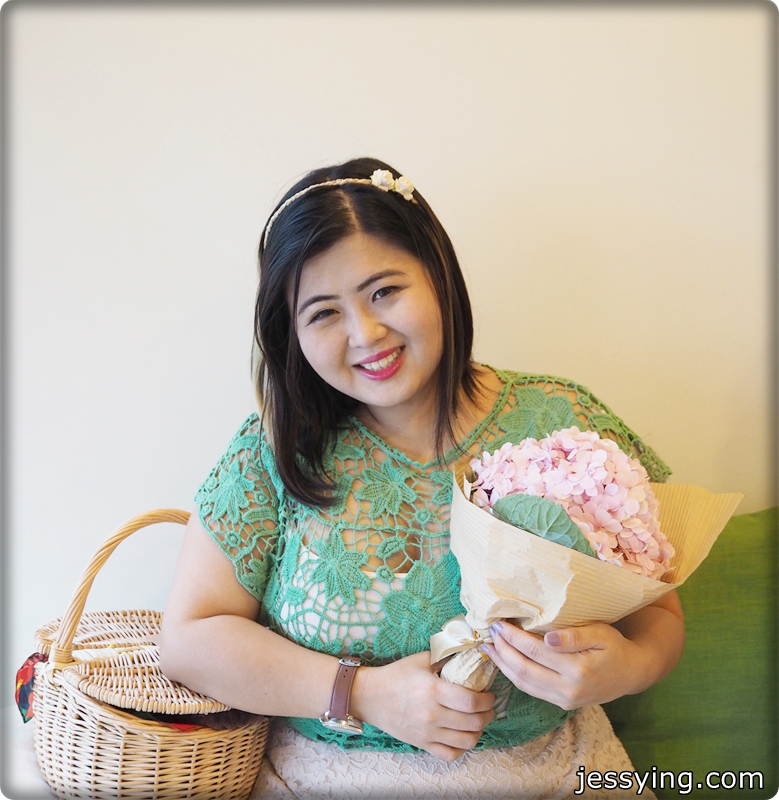 And me smiling happily with my favourite pink hydrangeas flower! Thanks guys for being so thoughtful, I had a bonquet of my favourite flower and a bunch of Innisfree products in a basket to bring home! Innisfree Jeju Sparkling Mineral Line products are already in Innisfree stores. Do give this a try if you are looking for a daily deep hydration skin care range and do enjoy the everyday hot spring spa-like sensation in their skincare range! If you don't know yet, not only Innisfree has their outlet in Sunway Pyramid , but they are also in Paradigm Mall and Pavilion Mall! Glad to see it's nearer to me now! And recently their Christmas sets are out... so time to check them out! p/s: Hope you guys learn something from my sharing here, feel free to ask or share your thoughts on Innisfree!